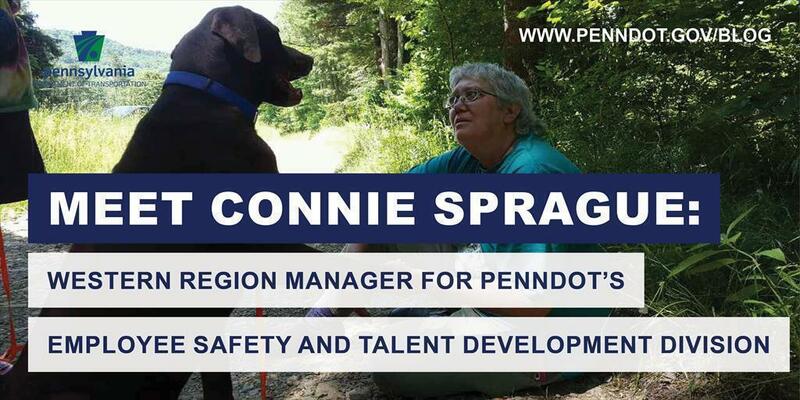 Connie Sprague is the western region manager for PennDOT's Employee Safety and Talent Development Division. She works out of the department's District 10 office in Indiana, Pa.
Five years with PennDOT. Prior 10 years with the Department of Corrections and three years with the Department of Labor & Industry. What other positions have you held with the department? HR analyst 2 for classification/placement/training/recruitment and HR analyst 2 as district safety coordinator. What do you do as a western region manager for Employee Safety and Talent Development? Manage and supervise the Employee Safety and Employee Training program areas for the western region, which is comprised of four districts — Districts 1, 10, 11, and 12. Supervise three training coordinators, a safety supervisor (who supervises four district safety coordinators), and a clerk typist 2. Provide leadership, guidance, direction, and support for the regional safety and training sections, identify strategies for improvement and ensure compliance with policies and standards and ensure consistency throughout the region. Identify training needs for the development and delivery of training for employee development and safety needs. I was looking for a challenge and a position where I could learn and utilize new skills. I was seeking to broaden my program area background by going into the role as district safety coordinator to assist in keeping employees safe in their working environment. I was also looking forward to being able to interact with so many employees on a constant basis. I wanted to work for a department where I could truly make a difference for employees and the department. PennDOT employees are like a “family.” People helping people whether they need assistance or advice on a professional/business playing field or if they simply need assistance in their personal lives from a house fire or some other catastrophic event. That the traveling public's safety and our safety are always first and foremost when we are on construction sites or simply in a work zone providing maintenance services and/or flagging. We also depend on the traveling public to help ensure we go home safely every day to our families and loved ones. I was raised by my grandmother the old-fashioned, country way, respecting every living thing and being grateful for every little thing. Live with my spouse, Les, and our fur babies – our dog, Duke, and our cats, Foggy, Hoppy, Fluffy, Kiki, and Missy. Hard working, team player, honest, loyal, great listener, and someone that can be counted on to go above and beyond. Country life on our property and at our log house. Gardening, landscaping, golfing, billiards, wood working, relaxing outside, and listening to music. I care for a feral cat community that my grandmother started caring for. This entails TNR (trap, neuter and return), vet care, shelter, food/water, and human interaction. I also volunteer at a local animal sanctuary on the weekends. Picture attached is of one of the rescued dogs, Duke, where I was gaining his trust. Duke was adopted by us.